Once there was a young cat. He was fast. He was strong. He always had enough to eat. The cat was the best mouser around. He could catch any mouse he saw. All of the mice were very afraid of him. Unfortunately for the cat, he grew old. As he aged, he became slower and weaker. He sometimes did not get enough to eat. The mice would see him coming and run away and hide. When he got older still, they did not even run away. They just stood around and laughed at him. They were no longer afraid. One day, the cat decided to use his brain to catch his dinner. The old cat laid on his back and quit moving. The mice came close by and laughed and laughed. "The old cat is too tired to even try to catch us," they said. The cat still did not move. One of the younger mice ran up and touched the cat and ran quickly back to where he started. The cat still did not move. The mice came closer and closer. "The Cat is dead," said one mouse. One by one, the mice began to climb on the cat's body. They ran from the front of the cat to the back. Then they ran from the back to the front. 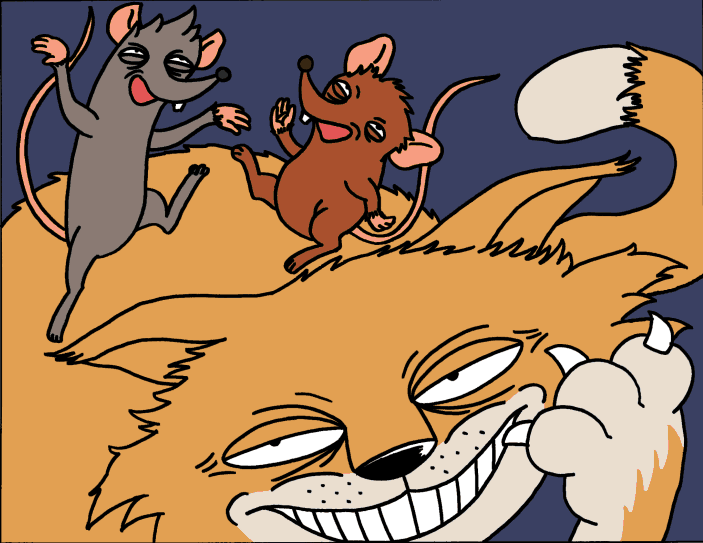 The mice laughed and laughed as they ran back and forth. One of the mice ran up the cat's head. "The cat is dead! Let's dance on his head!" Mice came from across the room to carry the dead cat away. Just then, the cat opened his eyes. He grabbed one mouse with his mouth. He grabbed two others with his front paws. The sly old cat ate well that night. He also ate well many nights after that. His dinner was more foolish mice who came to play when they thought the old cat was dead. It sometimes is best just to let sleeping cats lie.